When it comes to getting fit, there are countless exercise options. Learning about different types of exercise and identifying your goals can help you design an exercise program that meets your individual needs. Combining isometric and isotonic exercises is one design approach for optimal functional fitness. During exercise, muscles can develop tension while shortening, lengthening or staying the same length. Muscle shortening, known as concentric contraction, forces a joint angle to decrease. Muscle lengthening, known as eccentric contraction, causes a joint angle to increase. When tension develops in a muscle but the length does not change, the joint does not move, and the contraction is said to be isometric. When comparing isotonic to isometric exercise, you are comparing exercises that respectively initiate joint movement to exercises that are static, causing no movement. Isotonic exercise, also know as dynamic constant external resistance, or DCER for short, encompasses exercises where muscle tendons pull against bone to cause joint movement. 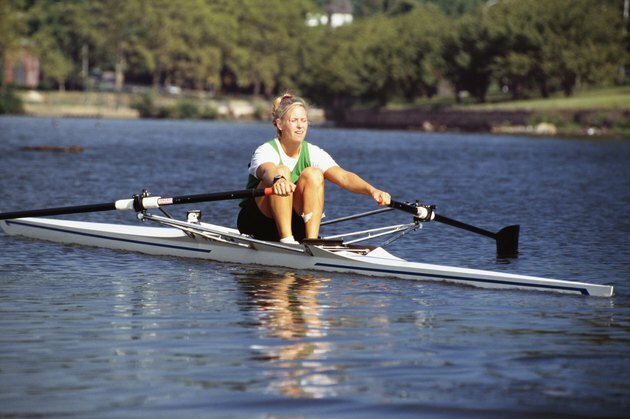 Any moving exercise, from weight training to rowing or running, falls into this category. In fitness, isotonic exercise most commonly refers to exercises that isolate a particular muscle or muscle group to increase strength or improve performance. Because most human activity and athletic performance involves movement, isotonic exercise is foundational to most training protocols. For the average exerciser, the American College of Sports Medicine recommends doing one to three sets of eight to 12 repetitions of isotonic resistance exercise for all major muscle groups, performed twice weekly. Isometric exercises are static, meaning no joint movement is involved. The training effect of isometric exercise is specific to the joint angle at which it is performed, within five to 25 degrees. For example, performing a "wall sit' exercise with your back against the wall and your knees and hips fixed at 90 degrees will result in increased strength at that angle, but the benefits will not carry over to joint actions that go far beyond that range. Strength adaptations from isometric exercise are a function of the length of time the body is held in position. To increase strength, hold the position for as long as possible until muscle failure. For the average exerciser, isotonic exercise provides the most useful improvements for daily function, but isometric exercise may nonetheless have a place in your workout regimen. Because muscles of the core perform the important function of stabilizing the spine throughout the day, isometric exercises like the yoga plank can be useful for strengthening those muscles. Isometric exercise can dramatically increase blood pressure and thus may be inappropriate for hypertensive individuals.